Tamarind Institute is pleased to announce the appointment of Nancy Zastudil as the new gallery director at Tamarind Institute. Nancy will officially acquire her new title on October 29, 2018, though she is currently representing Tamarind at the Fine Art Print Fair in New York City this weekend, October 25-28, 2018. Nancy Zastudil is an art curator, writer, editor, and administrator dedicated to making positive change through philanthropy and entrepreneurship in the arts. Zastudil was formerly the owner/director of Central Features Contemporary Art, a gallery in downtown Albuquerque that promoted the intrinsic value of art-making in contemporary culture, with a featured emphasis on the artist's role in environmental stewardship and social progress. The gallery closed in 2018 after four years and many exhibitions. 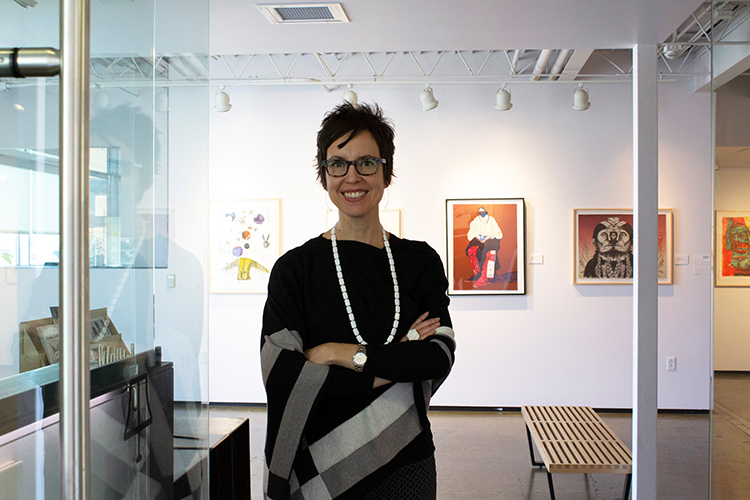 From 2012 until taking her position at Tamarind Institute, she was Administrative Director of the Frederick Hammersley Foundation and visual arts editor of Arts and Culture Texas. Previously, she was Associate Director of the University of Houston Cynthia Woods Mitchell Center for the Arts. Zastudil is editor of How Color Works: Color Theory for the 21st Century (Oxford Press, 2017); co-editor of edible Santa Fe art+food themed issues (2015 and 2016) and On the Banks of Bayou City: The Center for Land Use Interpretation in Houston (March 2009); and contributor to The Hustle Economy: Transforming Your Creativity Into a Career (April 2016). Magazines such as art ltd., THE Magazine, edible Santa Fe, Arts and Culture Texas, Dance Source Houston, Temporary Art Review, Art Lies, and more have published her exhibition reviews, features, and interviews. She serves on the Albuquerque Urban Enhancement Trust Fund Committee; and is the regional coordinator for The Feminist Art Project. Nancy holds a Bachelor of Fine Arts in Painting and Drawing from The Ohio State University and a Master of Arts in Curatorial Practice from California College of the Arts. She was born and raised in Columbus, Ohio. When asked about her new position, Zastudil reported the following: "I am honored to join the team at Tamarind as gallery director and am looking forward to working with the amazing staff to further expand on a tradition of contemporary art-making in Albuquerque and beyond. It feels vital, especially at this moment, to support artists in a shared vision of experimentation, collaboration, and learning and I'm thankful to be doing that at one of the most respected and far-reaching arts institutions in New Mexico." Tamarind Institute is an internationally recognized fine art lithography workshop affiliated with the College of Fine Arts of The University of New Mexico. Tamarind is dedicated to the preservation and advancement of lithography through education, research, exhibitions, and artist residencies, and is credited with introducing collaborative printmaking among contemporary artists around the world. Tamarind frequently sponsors programs with diverse populations, locally and internationally, benefitting University, Albuquerque, and New Mexico constituencies. For more information, call 505-277-3901, or email tamarind@unm.edu.